Southampton are on the verge of securing their Premier League status following their crucial 1-0 victory against Swansea City at the Liberty Stadium on Tuesday night, and defender Wesley Hoedt was one of their standout performers. Manolo Gabbiadini’s goal in south Wales means that a 10-goal swing will be needed when they host Manchester City and the Swans welcome already-relegated Stoke City on Sunday, with Huddersfield Town getting the draw they needed to survive against Chelsea on Wednesday. 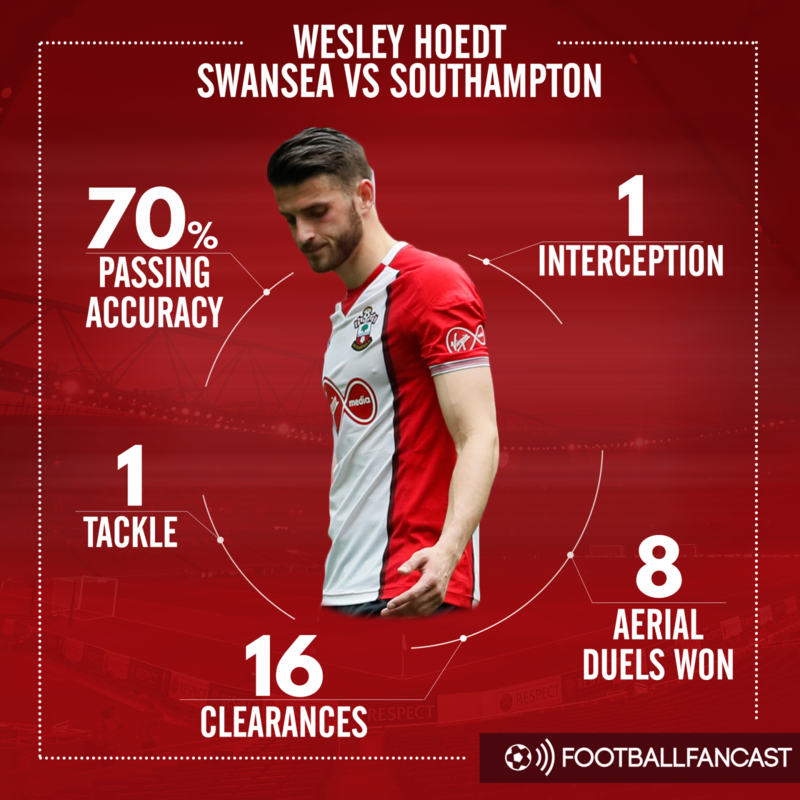 Hoedt has been widely criticised by Saints fans on Twitter for some of his performances this season as the south coast outfit have been struggling down the wrong end of the table, but it is his quality – or lack of – rather than his attitude that has often been called into doubt. While he has often struggled in the air, it was a different story at the Liberty Stadium as he won eight aerial duels against the likes of Andre Ayew, Jordan Ayew and Tammy Abraham, while he also made 16 clearances as he helped Saints keep a clean sheet. The Netherlands international also made one tackle and one interception, but while his defensive game was impressive his passing and decision-making when on the ball certainly still needs some work – he only had an accuracy of 70%. Many Saints supporters may not have wanted the 24-year-old next season if they stayed up because of some of his displays this term, but his showing against Swansea showed that he should be a regular starter in the 2018/19 campaign, as long as he is next to a new, dominant and experienced partner.